CHIVAS Brothers’ longest-serving employee, Alistair McAllister, has retired after just over 46 years, working for the company in Paisley. 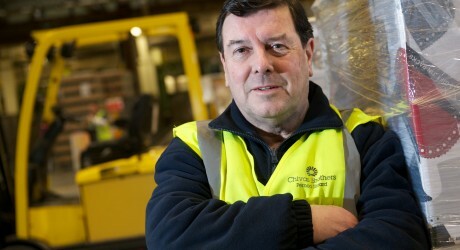 Alistair joined Chivas Brothers in the Stock Control department in July 1966, when he was just 17 years-old. He later moved to the loading bay area, and eventually to the North Bottling Hall, where he spent the last 25 years working as a forklift truck operator. Reflecting on his time with the company, Alistair, 64, said: “The time has flown by, and so much has changed in the last 46 years. “When I started the bottling halls were mostly manual, with the ladies who worked there using small plastic hammers to put the tops on the bottles. Today, with huge advances in modern machinery, production is much faster. “The area where the North Hall sits was just a field when I started. I remember it being built in the 1980s to keep up with demand. In future I think Chivas Brothers will just get busier and busier. Alistair’s colleagues surprised him with a cake, gifts and special visit by St Mirren FC mascot, The Paisley Panda, on his last day, which delighted the lifelong Saints supporter. Despite admitting he’ll miss his team, Alistair says he’s looking forward to his retirement, adding: “I’m going to get a new car, enjoy any sunshine we get this summer, and maybe plan a few holidays to places like Spain and Greece. MEDIA RELEASE posted by Chivas Brothers/Richmond Towers. You too can post media releases (aka press releases) on allmediascotland.com. For more information, email here.